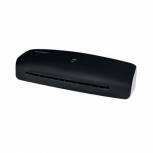 Q-Connect A3 Standard Laminator KF17004 Pack of 1 Q-Connect A3 Standard Laminator. 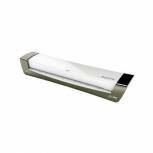 Useful for laminating business cards, documents and posters up to A3 in size. Preheating time 3-5 minutes. 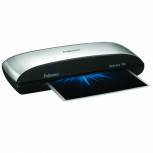 Laminating speed: 250mm per minute. Features LED on and ready indicators. 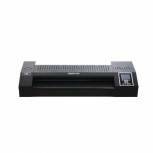 GBC Fusion 3000L A4 Laminator 4400748 Pack of 1 GBC Fusion 3000L A4 Laminator Black 4400748. Approx Lamination time (A4): 36 seconds. Warm up time: 1.5 minutes. Max Micron Pouch: 250 Micron. 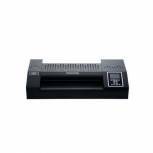 Fellowes Spectra A3 Laminator 5738401 Pack of 1 Fellowes Spectra A3 Laminator 5738401. Laminates up to 125 micron pouches. Heats up in 4 minutes. Release trigger for retrieving and re-aligning misfed documents. Includes a starter kit for 10 documents. 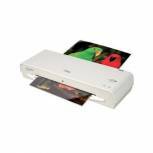 Q-Connect A4 Standard Laminator KF17002 Pack of 1 Q-Connect A4 Standard Laminator. 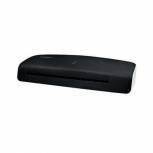 Useful for laminating business cards, documents and posters up to A4 in size. Preheating time 3-5 minutes. 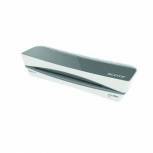 Laminating speed: 250mm per minute. Features LED on and ready indicators. 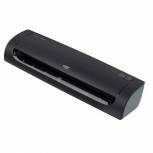 Q-Connect A3 Professional Laminator KF17006 Pack of 1 Q-Connect A3 Professional Laminator. 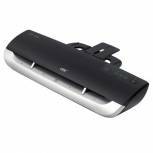 Useful for laminating business cards, documents and posters up to A3 in size. Preheating time 5 minutes. Laminating speed: 410mm per minute. 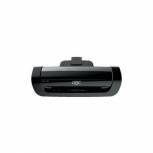 Features LED on and ready indicators, and 4 roller system to ensure quality. 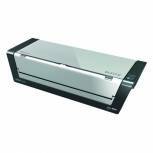 Fellowes Saturn 3i A3 Laminator 5736101 Pack of 1 Fellowes Saturn 3i A3 Laminator 5736101. Laminates at 30cm/minute. Laminates up to 125 micron pouches. 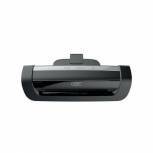 Heats up in 60 seconds with InstaHeat Technology. Feed sensor indicates when document has been misfed. 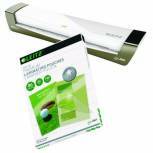 Includes a starter kit for 10 documents. 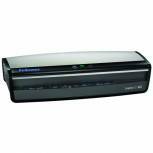 Fellowes Spectra A4 Laminator 5737901 Pack of 1 Fellowes Spectra A4 Laminator 5737901. Laminates up to 125 micron pouches. Heats up in 4 minutes. Release trigger for retrieving and re-aligning misfed documents. Includes a starter kit for 10 documents. 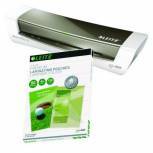 Leitz iLAM Home Laminator A4 Grey 73661080 Pack of 1 Laminates up to 200 micron (2 x 100 micron) pouches. Takes approx 60 to laminate one 160 micron sheet. Warms up in 3 minutes. Release trigger to free any mis-feeds. Low surface temperature for safer use around children. 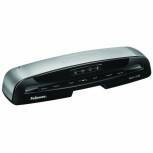 Fellowes Lunar A3 Laminator 5716801 Pack of 1 Fellowes Lunar A3 Laminator. 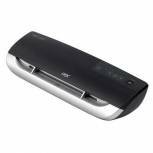 Entry level personal laminator ideal for the home office. Laminates at 30cm/Min. Laminates 80 micron pouches. Fixed temperature setting. 6 minute heat up time. Weight 2Kg.